From Jennifer Lopez and Iggy Azalea’s hit “Booty” to Nicki Minaj’s “Anaconda” and Kim Kardashian’s attempt to break the internet with a picture of her naked rear end, we’ve seen a year-long emphasis on asses in 2014. 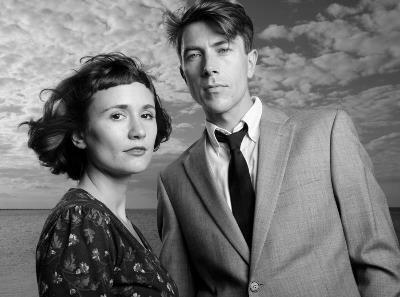 Pre-war blues troubadour Luke Winslow-King seems an unlikely edition to the list of musicians singing about derrieres this year, but he joined that group with “Swing That Thing,” the second song off his outstanding 2014 release Everlasting Arms. An up-tempo number that burns with the most show-stopping, foot-stomping energy found on the album, there’s no doubt that Winslow-King’s repeated command to “swing that thing” shares the main focus of “Booty” and countless other songs about the posteriors of young women. But, true to form, Winslow-King brings something entirely different and somewhat unique to his entreaties: a healthy respect for women in general, and for the woman he’s singing to in particular. That’s quite the permanent “hook up.” It should come as no surprise that the object of Winslow-King’s entreaties is his wife, bandmate, and constant companion Esther Rose King. As for the declarations of commitment, that was a case of art imitating life. So while the song is definitely about booty shaking, it is underpinned by this sense of genteel respect and commitment leading directly from the dance floor to the marriage chapel. What makes it perhaps even more remarkable is the fact that Winslow-King specializes in the blues, a sometimes gritty artform that isn’t always known for restraint, respect, or commitment. The contrast between the comparatively button-down life of Howlin’ Wolf and the “Hoochie Coochie Man” Muddy Waters can be seen as guideposts along two different paths, according to Winslow-King. “I think you can be tough and rocking, and you can be cool, and you can be an expressive bluesman from both perspectives,” he said. For Esther King, her husband’s on stage persona, writing style, and focus on the wholesome are all reflections of his real life. So It’s only natural that what could have easily been just another booty shaking song is instead a reflection of love and commitment. Loved his set at Crescent City Blues Fest.